Here’s a new twist on an old use for that leftover Thanksgiving turkey. It’s just as good made with chicken the rest of the year, too. 1. Preheat the oven to 375° and mist a deep dish pie pan with cooking spray. 2. Bring a large pot of well salted water to a boil and cook the spaghetti for one minute less than the package directions. Drain and return to the pot. Turn off the heat and cover. 3. In a large skillet, melt 1Tbsp of the butter and add the red bell pepper and garlic. Cook and stir just a couple of minutes until the bell pepper loses its edge and the garlic is fragrant, then add the mushrooms and cook a couple of minutes longer. 4. Add the wine, salt and pepper, and cook, stirring occasionally, until the liquid reduces by half, 3 to 4 minutes. Using a slotted spoon, remove the mushroom mixture to a plate and set aside. 5. Add the remaining 3 Tbsp of butter to the pan. When the butter has melted, sprinkle the flour all over, then stir to combine. Cook and stir 2 minutes. 6. Gradually pour in the broth, stir and continue to cook until the sauce begins to thicken, 3 to 4 minutes. 7. Add the cream cheese and Parmesan, continuing to stir until the cheeses mix in. 8. Remove one cup of sauce and stir it into the spaghetti in the pot. 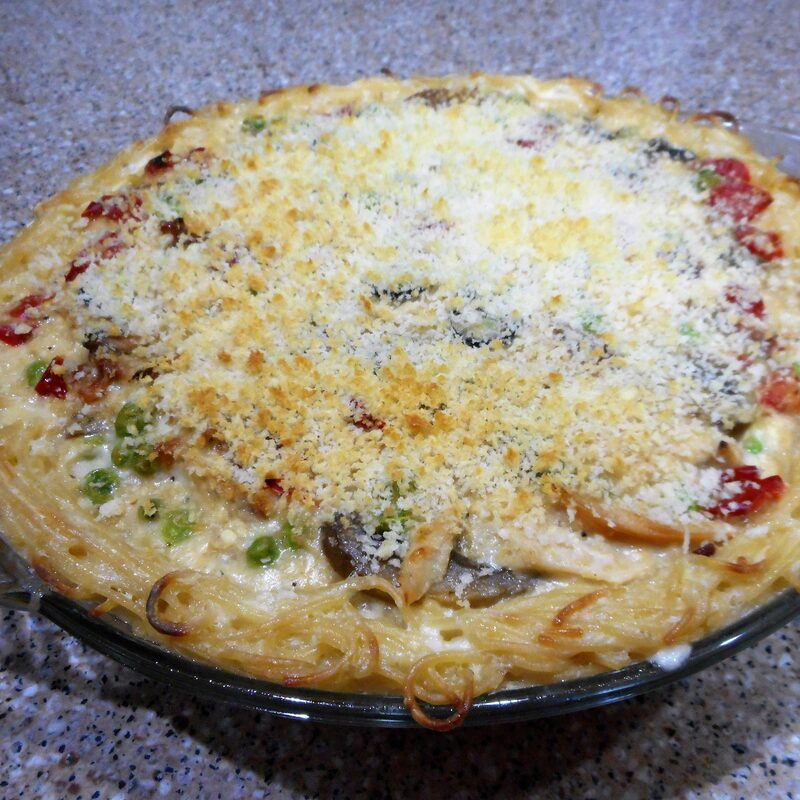 Transfer the sauced pasta to the prepared baking dish. As the noodles begin to cool you will be able to form them into a pie shell by pushing them up the sides of the dish and smoothing the bottom. You will probably have to repeat this action several times until you have a fully formed shell. 9. Meanwhile, add the turkey, peas, olives, and bacon to the remaining sauce along with the mushroom mixture. Stir until everything is well combined and just heated through, then add additional salt and pepper to taste. 11. Let stand, loosely covered, for 10 minutes before cutting to serve.